and employment package for their families. Chairing the federal cabinet meeting here, the Prime Minister said the policy should be placed before the next meeting for consideration. he added, concerted efforts be made to ensure timely progress. in energy and infrastructure sectors by 2017 18. The Prime Minister further stated that speedy progress on these projects was necessary for addressing the existing shortfalls and future demand. The completion of early harvest projects will go a long way in elimination of load shedding by summer 2018, he added. generate economic activity and enhance national wealth. 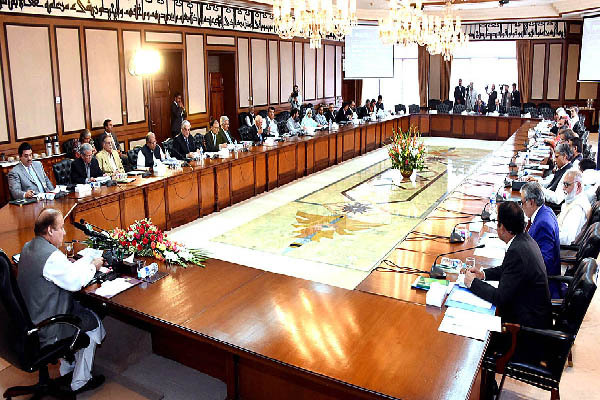 It will not only connect 200 million people of Pakistan but will also open up avenues of cooperation amongst people, communities and states across the region, the Prime Minister said. The Cabinet was informed that considerable part of portfolio under the CPEC has been energized while the remaining are in the pipeline. The Prime Minister expressed his firm support for the Thar Coal project, and stated that had its potential been exploited 50 years back, the nation would now have been an energy exporter. Progress made so far on the Gwadar port project and allied infrastructure facilities was also reviewed in the meeting. and the Eastbay Expressway at the earliest. He said that work on the technical and vocational training institutes of Gwadar be done on a fast track basis, making them operational as soon as possible. The Cabinet, while approving in principle the summary of the Housing and Works division regarding the Joint Venture Policy for Land Development in collaboration with the private sector, with the objective of providing accommodation or plots to government servants before retirement, formed a Committee to finetune the policy guidelines. Committee will present its report to the Cabinet. the Government of Turkmenistan on Defense Cooperation. Governments of Pakistan and Japan/JICA. Department of Malaysia on Cooperation in Public Sector Auditing. Approval for signing of bilateral MoU between the Supreme Audit Institution of Pakistan and the State Audit Office of Vietnam on Cooperation in Public Sector Auditing Approval for initiation of negotiations between the State Bank of Pakistan (SBP) and the Central Bank of Russia on signing of MoU on “Banking Supervisory Cooperation”. Approval for signing of agreement between Pakistan and Turkmenistan on Abolition of Visa for Holders of Diplomatic Passports. Approval for signing the Negotiated Treaty on Extradition between the Islamic Republic of Pakistan and Republic of Kazakhstan Interior Division. Approval in principle for initiating negotiations on the Memorandum of Understanding between the Government of the Islamic Republic of Pakistan and Government of the Republic of Kenya on Cooperation in Combating Illicit Trafficking and Abuse of Narcotic Drugs, Psychotropic Substances and their Precursors.